Valves are linear with almost parallel, but subtly triundulate margins and obtusely rounded apices. The vavles are not, or only very slightly, dorsiventral. The axial area is narrow, two to three times wider than the raphe and follows the apical axis. The central area is small and transversely rounded or rectangular. The raphe is lateral, becoming filiform at the proximal and distal ends. Proximal raphe ends are displaced slightly to the ventral side and the ends not, or only slightly, expanded. Distal raphe fissures are sickle-shaped and deflected dorsally. Striae are radiate, becoming parallel at the apices and more widely spaced about the central area. 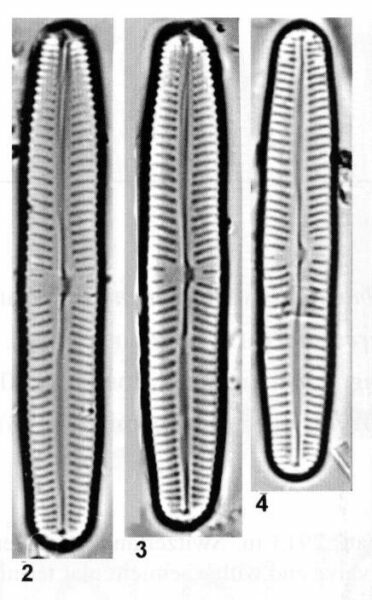 Areolae are indistinct and number 30-40 in 10 µm. Cymbopleura oblongata has been confirmed from a few seeps, ponds and streams of the Canadian Rockies or Crown of The Continent Ecoregion in Glacier National Park, Montana and Waterton Lakes National Park, Alberta. Here it prefers cold, oligotrophic waters with low specific conductance. Krammer (2003) reports that this taxon is restricted to the boreal and subarctic regions, where it is not often recorded. 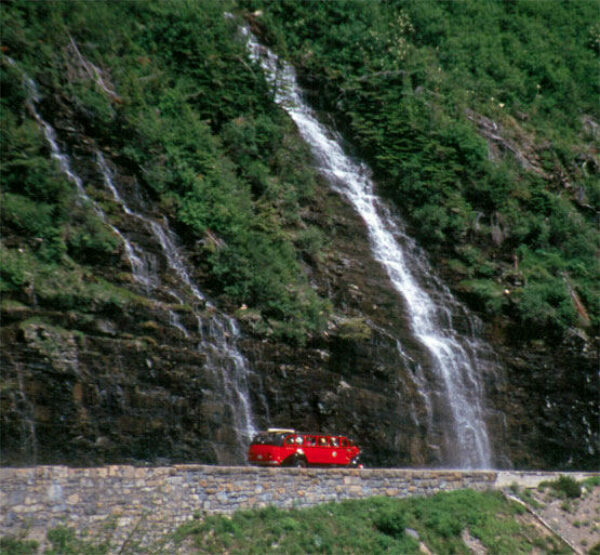 Weeping Wall along the Going-To-The-Sun Road in Glacier National Park, Montana. A similar habitat nearby supported a large population of Cymbella laevis. Valves not or only very slightly dorsiventral, linear, dorsal and ventral margins nearly straight, ends obtusely rounded or (and) slightly broadly hatchet-like rostrate. Length 29-67 µm, breadth 7.4-9 µm, maximum length/breadth ratio 7.4. Axial area narrow, almost in the median line of the valve. Central area up to 2/3 the valve breadth, rounded or irregular shaped, sometimes asymmetrical and then more well-developed dorsally or ventrally, in smaller specimens sometimes nearly absent, in post primary cells large. Raphe variable from slightly lateral to distinctly lateral, narrowing towards the proximal and distal ends. Proximal raphe ends slightly or not expanded and somewhat ventrally tipped; terminal fissures sickle-shaped and dorsally deflected. Striae slightly radiate to radiate in the middle portion, curved, becoming more radiate or parallel near the ends, indistinctly punctate. 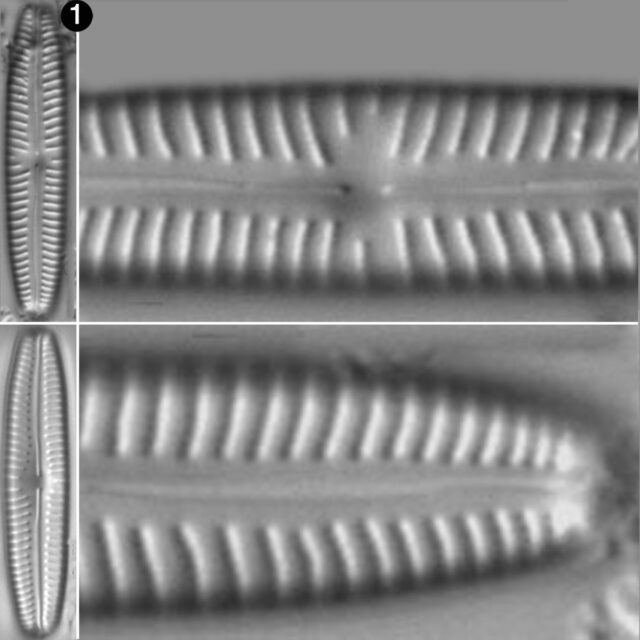 Striae in the middle portion (dorsal) 9-12/10 µm, up to 14/10 µm towards the ends, puncta more than 30/10 µm. Cymbopleura oblongata has nearly linear valves with subtly triundulate margins. Valves are not, or only slightly, dorsiventral.